Vermeer is considered one of the greatest painters who ever lived. He is known for his skill at painting the effects of light and shadow and for his ability to make the simplest detail in a painting important. His paintings are so realistic they seem almost photographic. He was a brilliant master in his dramatic use of light and shadow. Studying the details of the paintings in this packet teaches much about life in 17th Century Holland. The artist gives us visual clues about the Dutch culture and invites us to share a frozen moment from a time that existed four centuries ago. Vermeer lived at the end of Holland’s “Golden Age”. Although small, the Netherlands became very powerful. Dutch traders traveled to Europe, Asia, Africa, and the Americas. They brought back great wealth. The Dutch also explored and settled new lands. It was a time of great prosperity for the middle class. These paintings show the everyday lives of middle-class Dutch people during the 1600’s and they are referred to as Genre (jon ruh) paintings. The scenes are all interiors, paintings featuring rooms inside a Dutch house. These are not portrait paintings, although there are people in the paintings. The room is the major feature of the picture, not the people. The light, the room, and the furnishings are filled with important detail. Holland’s newly independent, predominantly Protestant, prosperous middle-class, rejected traditional religious art and wanted art depicting their daily lives. Until the 1600’s, there had only been two classes of people—rich and poor. During that time, only the extremely rich, or else the Catholic Church, had the money to pay an artist for a painting. In the 1600’s a new middle-class of people began to emerge in Holland. A new Baroque Style of Art began too, which featured dramatic light and shadow and authentic realism. The new art style was especially well suited to large-scale pictures—the kind of art found in a large church or palace. Dutch Protestant churches were very plain. They did not decorate their churches with religious Portraiture and some even found it offensive. Still, the Dutch appreciated the natural realism and dramatic use of light and shadow used in the Baroque. Dutch Genre paintings were substituted for religious subjects, to showcase the dramatic light, shadow, realism and detail of the new Baroque Style. Holland’s new middle-class class had money to buy paintings. They wanted art reflecting what they were interested in. Dutch merchants especially loved Portraits, either of themselves or groups of people. Several Dutch painters specialized in pictures of carefully arranged objects, like fruit, flowers, tapestry and dishes. These Still Life paintings were a chance to show off elegant possessions. Holland also had a prosperous farming community. Because farmers also had money, another popular art subject became domestic animals such as cows, sheep and poultry. Dutch Landscape artists painted views of the flat Dutch countryside, dotted with trees, windmills and churches and became especially noted for painting very large and beautiful areas of sky. The Dutch Genre paintings allow us see inside these middle-class homes of Holland in the 1600’s. Make sure ALL 9 pictures are returned to the Packet Carrier after your presentation is finished! Barroco: Italian word meaning a natural pearl of bizarre colors and grotesque shape. Baroque: Artistic style that was dominant in the late 16th and 17th centuries. It is not known for sure who named the style, but the title seems to have been intended as an insult. The word is related to the Italian word barroco. Camera Obscura: (Latin-“light chamber”) An apparatus which projects the image of an object or scene on to a sheet of paper or ground glass so that the outlines can be traced. It consists of a shuttered box or a room, with a small hole or lens in one side, through which light from a brightly-lit scene enters and forms an inverted (upside down) image on a screen placed opposite the opening. The optical principle is essentially that of the photographic camera. For greater convenience, a mirror is usually installed, which reflects the image the right way up on to a suitably placed drawing surface. The principle was known as early as Aristotle, but the first written account of its use for drawing is credited to Giambattista della Porta, a physician of Naples. His description in his work on popular science, Magiae Naturalis (1558) did much to make the device widely known, and by the 18th century the camera obscura had become a craze. Both amateurs and professionals—among them the painter Canaletto—were using it for topographical (landscape) painting, and we hear of an apparatus, somewhat like a sedan chair (car seat), inside which the artist could sit and draw, at the same time activate bellows with his feet to improve the ventilation. More modest versions were easily portable and even pocketable. Cittern: An old musical instrument related to the guitar and mandolin, having a flat pear-shaped sound box and wire strings. Cityscape: A view of a city or a large urban center; a picture representing such a view or containing elements suggestive of such a view, as rectangular shapes of various proportions resembling the forms of buildings. Ermine: An Old World weasel having a white winter coat with black at the tip of the tail; the lustrous, white, winter fur of the ermine, often having fur from the animal’s black tail tip inserted at intervals for contrast; the rank, status, or position of royalty or a judge who, in some parts of the world, wears a robe trimmed with ermine on official or state occasions. Genre: (pronounced JON ruh) Art term for paintings depicting scenes from daily life. It may be applied to appropriate art of any place or period, but most commonly suggests the type of domestic subject matter favored by Dutch 17th Century artists. In a broader sense, the term is used to mean a particular branch or category of art; Landscape and Portraiture, for example, are genres of painting, and the essay and the short story are genres of literature. Idealize: to make ideal; represent in an ideal form or character; exalt to an ideal perfection or excellence. To represent something in a way that looks better than reality. Interior: A pictorial representation of the inside of a room. Landscape: A view of outdoor scenery, such as mountains, rivers, fields, flowers, or forests. A painting or drawing showing a scene from nature. Portrait: A picture of a person or an animal. Portraits tell about the people they picture. A painting, sculpture, drawing, photo, or other work of art showing a person, several people, or an animal. Portraits usually include part or all of the body as well, but may show only the face. 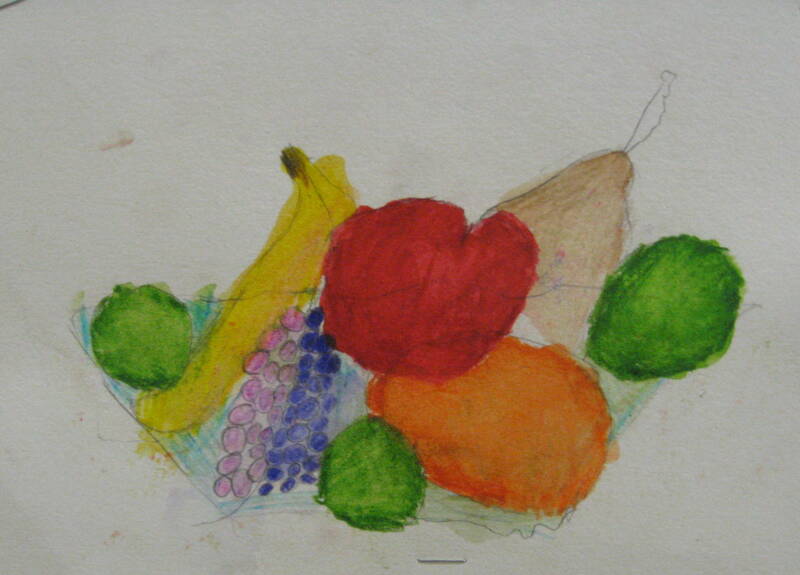 Still Life: A drawing or painting of nonmoving (inanimate), nonliving objects, such as fruit, flowers, or bottles. Usually, a still life is set indoors and contains at least one man-made object, such as a vase or bowl. Who was Jan (Johannes) Vermeer (van der Meer)? In 1866, a Frenchman named Joseph Burger saw a painting that changed the course of Art History. The painting, A View of Delft, was a Cityscape that had been painted almost 200 years earlier by an unknown artist named Jan (YAWN) van der Meer (van dur MEAR). Burger could not understand how an unknown artist could have painted such a masterly work. He felt that maybe van der Meer’s other paintings must have been credited to other artists. From that moment, Burger searched all over Europe, hoping to find more paintings by this mysterious painter. The few things we know about Jan Vermeer (YAWN vur MEAR), as he is commonly referred to today, come from public records and very little is actually known about his life. The artist was born in Delft, Holland sometime in the month of October because it is recorded that he was baptized there on October 31, 1632. Vermeer was the son of a silk weaver, who was also an art dealer and ran a tavern. The family lived in a house on the Market Square, with weaving rooms upstairs and the tavern below. The walls of the tavern were used to display the paintings Vermeer’s father sold. On April 5, 1653, Vermeer married Catharina Bolnes, the daughter of a brick maker. Jan was also admitted to the Painters’ Guild in 1653. The death of his father (1654), the year after Vermeer became a master painter, left him to take care of his mother, his wife, the house, and the business. Twenty years later, December 15, 1675, Johannes’ (YOH hawns) death is recorded. His death register mentions that he had eleven surviving children. Few other details of his life are known. Vermeer paintings are some of the rarest, most sought-after art treasures. 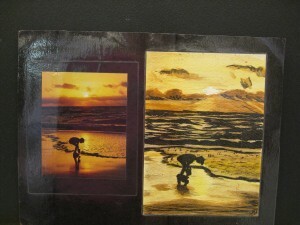 He is considered one of the “Little Dutchmen” artists because of his attention to small details. The liveliness of Vermeer’s light and naturalness of his colors have never been equaled. His paintings are Dutch “Genre” (JON ruh), meaning they depict realistic events of everyday life. Most of Vermeer’s scenes are interiors; he painted only two known outdoor scenes. These interiors display the domestic life of the prosperous, respectable, middle-class of 17th century Holland. His paintings typically feature one or two women at a simple daily task, such as reading or writing a letter, sewing, or playing a musical instrument. The artist frequently paints a window, with bright daylight shining through, which dances and bounces off the figures. Vermeer was infinitely painstaking in his painting, spending months on every picture. This was probably the reason he died in bankruptcy—he could never produce enough paintings to make a great living. Jan Vermeer was obsessed with surface appearances and with optics. Many of his works were created with the assistance of a filmless forerunner of the modern camera called the Camera Obscura. Using a series of lenses, this machine lets the viewer isolate and focus on a single subject with breathtaking clarity. A camera obscura was probably used for his painting of The Girl with the Pearl Earring and his ten other paintings showing pearls. Clues of this are the soft, blurry edges of the portrait and the magnification of the close up view. The Soldier and the Laughing Girl also shows signs of the assistance of this tool with lenses. Johannes (the “s” is silent) Vermeer’s paintings contain several familiar and similar elements. In many paintings, the artist uses the same props and even the same costumes. A cloth-covered table is often included and this is usually draped with additional elegant fabric or an imported rug. The artist must have owned chairs with lion’s heads carved on each side of the back, since the same chairs can be seen in several paintings. Sometimes a curtain is used in front to help frame the person or the scene. The artist’s paintings often feature maps or paintings hung on plaster walls. Other familiar Vermeer features include checkered floors, women reading or writing letters, musical instruments and women with pearls. Vermeer especially loved the effect of light on pearls! Jan Vermeer lived during a time of new discoveries and changes in art. The artistic style that was dominant in the late 16th and 17th centuries is called Baroque. It is not known for sure who named the style, but the title seems to have been intended as an insult. The word is related to the Italian word barroco, meaning a natural pearl of bizarre colors and grotesque shape. Baroque Style began suddenly and shook and changed art traditions in a new way. The Roman painter, Caravaggio, was responsible for the beginnings of the disruptive differences of this painting style. Caravaggio depicted his subjects in a very realistic and natural way—warts and all. He did not try to make people look better than they really were (idealized). Caravaggio also treated the light and shade around his figures with a dramatic contrast of deep brooding shadows and brightly illuminated spaces. In Holland, Caravaggio’s new ideas were taken up with enthusiasm by the first generation artists of what eventually became known as The Golden Age of Dutch Painting. The Catholic Church had an influential role in the flourishing of the Baroque in a movement called the Counter-Reformation. The church enacted sweeping self-reforms (AD 1545-1563) and major changes to clarify every doctrine challenged by the Protestants. These changes included guidelines for artists on how to combine realism with religious sensibility. Religious painting suddenly took on a very different and realistic look, created to teach the stories of faith in a more emotional and captivating way and to influence people to come back to the church. (Charges of church corruption, originally made by Martin Luther, had caused many church members to leave.) Artists began painting energetic and sometimes frighteningly realistic and dramatic religious figures. The dramatic use of light and shadow became important in creating a proper mood or feeling for the dramatic and sacred stories these works depicted. Baroque was not exclusively associated with religious art. In predominantly Protestant Holland, Baroque’s influence encouraged extraordinarily natural realism and the dramatic use of light and shadow. Aspects of Baroque can be seen in works that have nothing to do with religious emotional display—for example in the dynamic lines of certain Dutch Still-life paintings. Dutch Genre paintings were substituted for religious subjects, found in other predominantly Catholic nations, to showcase this new Art Style. The new wealth of a prosperous merchant class in 17th century Holland also affected the Baroque Style. Without the Catholic Church and a wealthy Aristocracy to commission artwork, Dutch artists were now dependant on middle-class society and the marketplace for their livelihood. Merchant class customers could show off their elegant finery and costly jewelry in extremely realistic, commissioned Portrait or Still-life paintings. Oriental rugs, elegant draperies, and stylish fashion were indicators of prosperity often found in the Baroque. Dutch merchants especially loved Portraits, either of themselves or groups of people. Several Dutch painters specialized in pictures of carefully arranged objects, like fruit, flowers, tapestry and dishes. These Still Life paintings were a chance to show off elegant possessions. Holland also had a prosperous farming community. Because farmers also had money, another popular art subject became domestic animals such as cows, sheep and poultry. Dutch Landscape artists painted views of the flat Dutch countryside, dotted with trees, windmills, and churches and became especially noted for painting very large and beautiful areas of sky. In a region where previously there had been few artists, an abundance of artistic talent suddenly emerged. This was very unique and never occurred before (or since) in history anywhere else in the world! Jan Steen (c. 1626-1679) was one of many notable artists who brought an unprecedented depth and range to the Dutch School. The three phases of art in the Dutch Golden Age are represented by its three greatest artists—Frans Hals (c. 1580-1666), Rembrandt van Rijn (1606-1669), and Johannes Vermeer (1632-1675). Vermeer, the youngest of the three, came late to the scene. Vermeer’s subject matter was common among the painters of his day but he brought a subtlety and purity to his art that made it mysteriously out of place when compared with that of his contemporaries. His art just had “something” the others didn’t. These three greatest Dutch artists of the 17th century died within ten years of each other and, with their deaths, the Golden Age of Dutch Art ended. Discuss the checkered pattern of the floor in The Love Letter and The Artist in His Studio. If possible, bring in a Library book of additional Vermeer paintings. Find other Vermeer scenes showing a patterned tile floor. Share these and compare the patterns found in the tiles. Have kids design their own floor tile PATTERN on graph paper (K-1). A good lesson for PATTERN and SPACE would be to use this floor pattern page in a drawing (or painting) of a room interior (3-5). This can be a challenging project for older kids. They will need to analyze how to use the space in their picture so that the graph paper floor, or at least part it, can be seen (great brain exercise!). Look for the artist’s signature in The Love Letter (On the wall, to the left of the maid, above the basket) and Girl With the Pearl Earring (dark upper left corner, but look very closely to see it). Vermeer stacked the first letter of his first name (it looks more like an “I” than a “J”—people wrote differently back then) on top of the first letter of his last name (“M” for Meer). 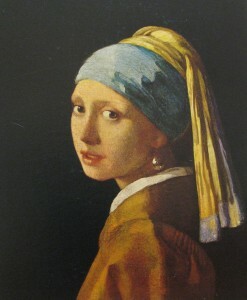 Vermeer was known by different versions of his name. 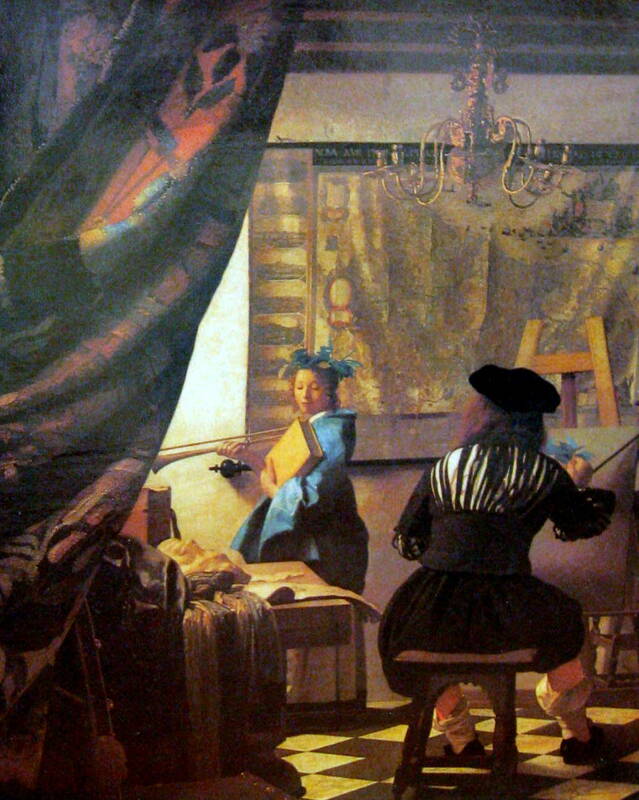 Check out a book of Vermeer’s paintings and bring it to class. Look for other paintings with his signature to project with the help of the classroom visualizer. (Talk ahead with teacher about this.) Above the framed map of The Geographer, Vermeer used a completely different signature—I Ver Meer and under that, MDCLXVIIL, Roman numerals for the year 1668, when this picture was painted. Have kids develop their own artistic signature with their own names. Add the current year (in Roman numerals) along with name in some creative way. Vermeer did not sign all of his paintings, probably part of the reason he was a forgotten artist for almost 200 years! Write a story about what is happening in a favorite Vermeer painting viewed today. Vivaldi’s Concerto in C for One Mandolin will give kids an idea of string music from this time. The Dutch also popularized Still Life painting. Set up a Still Life model with fruit, flowers, or vegetables on an elegantly patterned cloth. 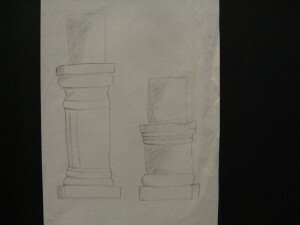 Include a vase or a stylish silver/gold candlestick to create the look of elegant Baroque style. Elegantly patterned fabric or an oriental rug would make a nice table covering for your display. 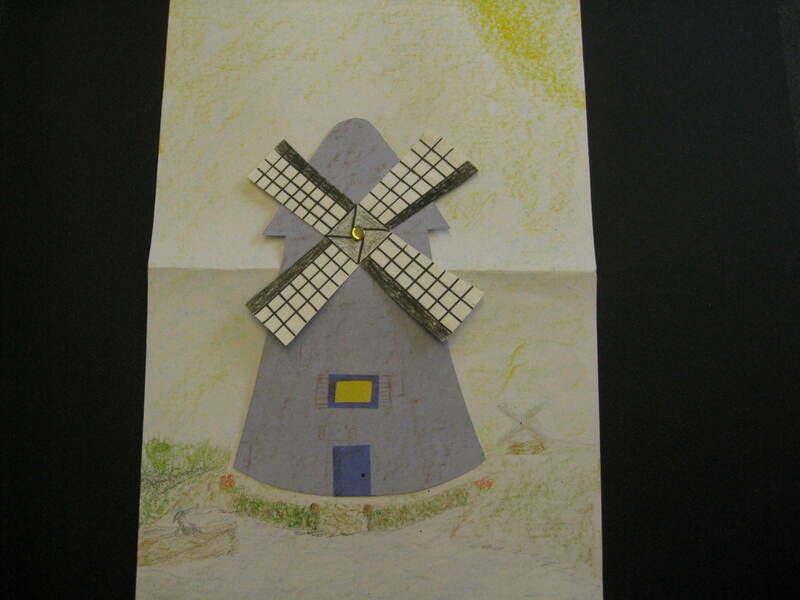 ─ Reproduce the model by cutting the shapes of the objects from colored paper, and then glue these objects to a background for a Still Life picture (K-2). ─ Bring in a lamp without a shade and set on one side of the model. 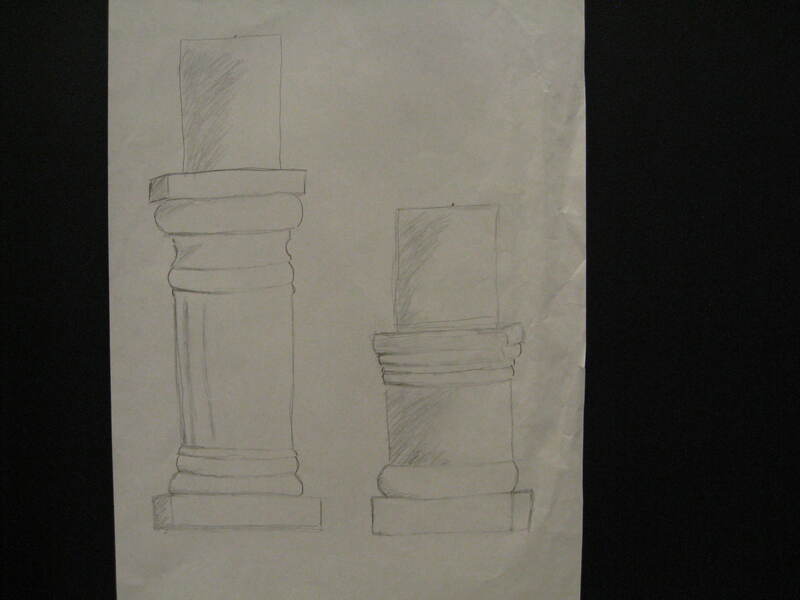 Turn on the lamp and turn down the classroom lighting to create shadow on the Still Life arrangement. 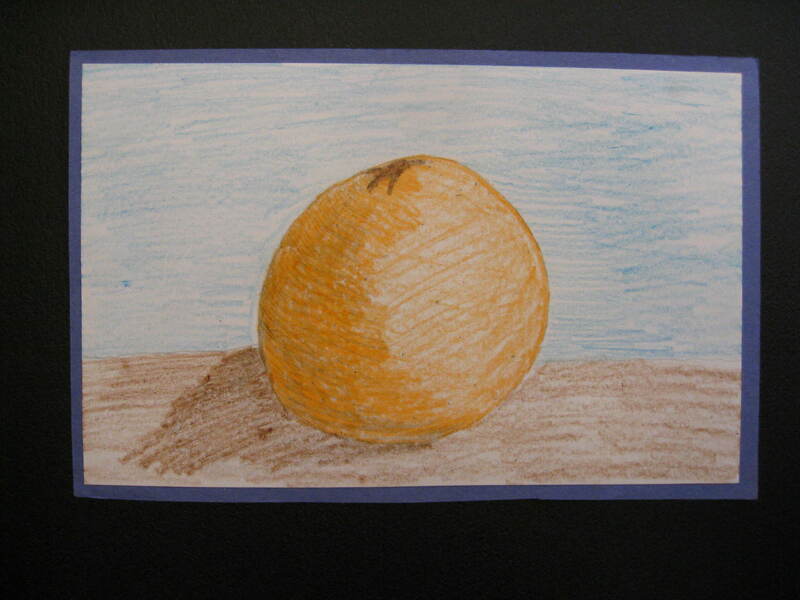 Reproduce the model using tempera, watercolor, or charcoal to show this light and shadow (3-5). To paint shadow, create SHADES of the colors by adding black. For highlights (reflected light), create TINTS by adding white. Listen to Two Part Inventions in C Major by Johann Sebastian Bach, for an example of Baroque music. Maybe the teacher could begin reading to the class Chasing Vermeer, by Blue Balliett, a few weeks before your visit (the earlier the better). If the teacher agrees to do this, recommend that she check this website first, http://scholastic.com/titles/chasingvermeer/index.htm, to help the kids get the most from the book. There is a hidden message and a hidden puzzle in the book’s illustrations. Teachers can find the solutions ahead of time at the web address, also information on the author and the illustrator, and great activities for the kids relating to the story. This mystery is great for 4th and 5th graders and even adults. It also has real Vermeer information. If the class has at least begun reading the book, your Presentation will have much more meaning to them! Portraits of “domestic” animals were also a popular art subject in 17th century Holland. Younger kids might enjoy a display of several typical farm animal photographs they could choose from for creating an animal Portrait—cows, pigs, ducks, chickens, horses, sheep, goats, dogs or cats. Clay animal sculpture portraits would also be fun! 1. 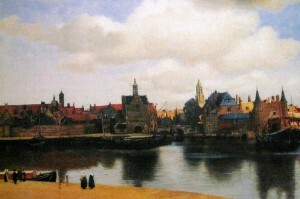 “A View of Delft” by Johannes (the “s” is silent) Vermeer. 38 ¼” x 46 ¼” (Circa 1660). In 1866, a Frenchman named Joseph Burger saw a painting that changed the course of Art History. The painting, A View of Delft, was a Cityscape that had been painted almost 200 years earlier by an unknown artist named Jan van der Meer. Joseph Burger’s search uncovered 70 paintings by the artist, who is now known as Jan or Johannes Vermeer. Burger wrote articles about this artist and sparked international interest in this once forgotten master painter. Suddenly, Vermeer paintings were appearing everywhere. Many Vermeer paintings had been mistakenly credited to other, better known Dutch artists. But in 1907, art experts agreed that only 36 of these paintings could be positively identified as the work of Vermeer. 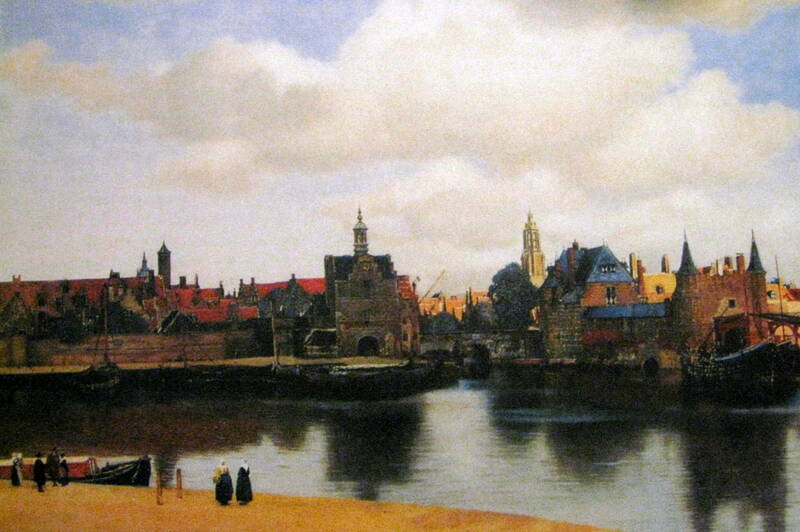 Vermeer painted two known cityscapes, this one and A Little Street (1658). This is a morning scene. The city clock reads 7:10 (below the tower of the building just to the left of center, if you have a magnifying glass). Vermeer’s paintings have such photographic realism it is as if we can see this city just as it looked almost 450 years ago! Each example of Vermeer’s art creates a very realistic feeling, as if we have traveled back in a time machine to 17th century Holland! What type of MOOD does this scene create for you? All answers are correct as long as kids can explain which clues in the picture helped them decide on their answer. Vermeer has created a scene filled with calm tranquility. Point out how calm the water is—almost motionless. Can you see the tiny ripples on the surface of the water? What features do you see in the FOREGROUND of this painting? (The area closest to the viewer, at the bottom of the picture.) Two women chatting. If you look closely here, you will see that Vermeer tried to paint out another figure next to the two women. Traces of this are still visible. You might see a bright halo around the women, where the third figure was painted over. Look closely at the picture. Can you find small white dots of paint on the brick walls, trees and boats? Why did the artist paint these white dots in the scene? Point out that it is a sunny day. The small globules of paint dotted over the surface are the artist’s way of highlighting, or capturing the light glittering off the water and reflecting on these objects. 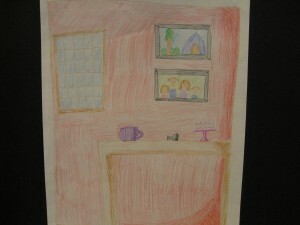 (K-3) Paint or draw a picture of your neighborhood. Draw the houses on your street and yourself with some of your neighborhood friends. Do you ride bikes together outside? Do you roller blade or play in the yard? Imagine and create a typical neighborhood scene. Create a Landscape featuring ¾ of the picture painted as sky, like a 16th century Dutch artist. 2. 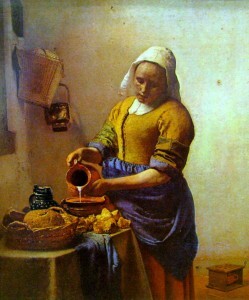 “Maidservant Pouring Milk” (Also referred to as “The Kitchen Maid”) 18” x 16” (Circa 1655-1660). Although we know little about this artist, we do know that Vermeer was extraordinarily talented! His paintings are some of the rarest, most sought-after art treasures today. The entire back wall of this scene is softly illuminated and sets off the dark edge of the cook’s shoulder and skirt so clearly that it is easy to tell exactly where she is standing—halfway between us (the viewer) and the wall. Except for two nails that have been painted with meticulous care, the wall is blank. On the floor, to the right and behind the maid, is a wooden foot-warmer. The baseboard of the wall is covered with tiles. 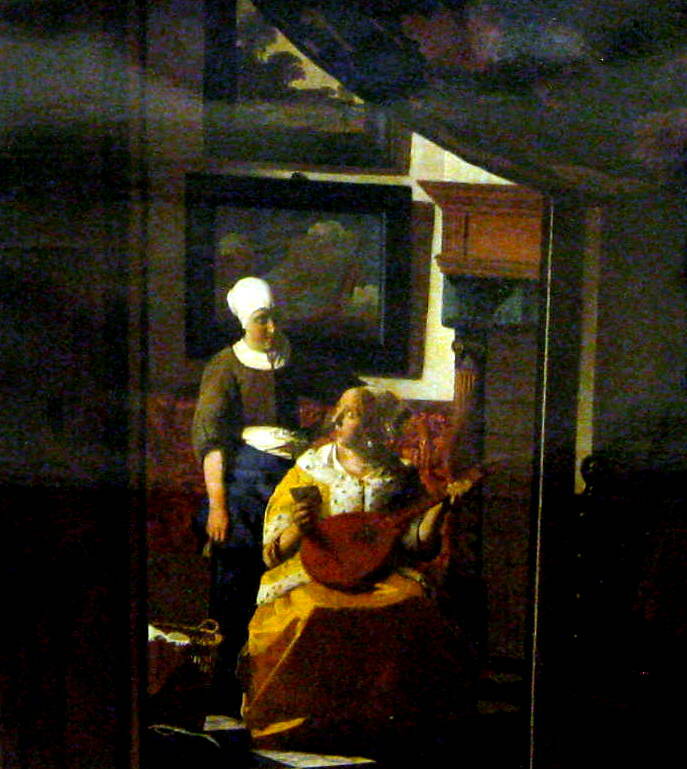 Several typical details can be found in a Vermeer painting. First, he mostly painted indoor scenes, which usually show one or two women at a simple task, such as reading, writing a letter, sewing, playing a musical instrument, or pouring milk. Vermeer often includes a cloth-covered table in his scenes. He also often paints a window on the left of his pictures, with bright daylight dancing and bouncing off the people in the room. We are in the corner of an old 1600’s Dutch kitchen. We see the cook pouring out creamy milk for a typical Dutch 17th century bread-and-milk lunch. Vermeer was a master at creating objects with TEXTURE in his paintings. Artists create two types of texture—Actual Texture, the type you can actually feel (like a sculpture) and Implied Texture, the type visually and realistically created by a great painter magician. Have you ever smelled freshly baked bread? Do you think this kitchen smells like freshly baked bread? (ALL ages should discuss TEXTURE.) Bring in a loaf of crusty bread in a basket similar to one in the painting. Set it at the front of the room before you begin your presentation. When you begin discussing this picture, tear the bread into pieces. Discuss the texture of the outside crust. Compare it to the inside, after tearing it apart. How would you draw this texture using only LINE? Discuss the texture of the baskets, the pottery and the metal container hanging on the wall. Discuss the texture of her dress—soft and delicate, or course and rough? (Grades 3-5) Explain the difference between Actual Texture—the actual bread you can touch—AND Implied Texture—the illusion of texture that a talented artist can create on a flat, two-dimensional surface. Like a magician, great artists use tools such as COLOR, SHADOW, HIGHLIGHT, or PATTERN to help them create an impression of actual texture in a painting. 3. “Woman with a Water Jug” 18” x 16” (c. 1663). Vermeer is known as one of the “Little Dutchmen” artists because of the attention he paid to the small details of his paintings. His paintings are Dutch “genre” (jon-ruh) scenes. This means the pictures depict realistic scenes or events from everyday Dutch life in the 1600’s. They are interior scenes. Vermeer’s work reflects, almost as in a mirror, quiet moments in the household life of the prosperous, respectable, and middle-class Dutch world of the 17th century. His paintings show us an instant in time, when all action has been stopped so that we can closely examine everything in the room as the “actors” pause under a magic spell. For Vermeer, light was nature’s paintbrush and he was a master of light and shadow. The main point of this painting (and the others) is to show the effect of light. The woman in this painting seems lost in studying something outside the window, which we can’t see. The table is covered with a Turkish carpet. This kind of carpet is seen in many Dutch genre paintings of the time. Carpets like this were one of the many exotic imports that appealed to the 17th Dutch. These rugs rarely appear on the floor of Dutch interior paintings. This was because they were probably considered too precious so they were placed on tables for decorations instead. In the 17th century, even the richest people used rustic woven reed mats to protect their floors and keep their feet warm during winter. Compare the pitchers found in this painting and in The Kitchen Maid. How are they different? How are they alike? One pitcher is pottery, the other metal, reflecting the color and pattern of the tablecloth it sits on. The pottery pitcher has a curved, rounded form and the metal pitcher has a straight and angled form. Compare the rest of this picture with The Kitchen Maid. How are they different? How are they alike? The kitchen scene tablecloth is a plain, solid color. The other tablecloth is a rich red, with an elegant pattern. Both have a window with light shining through on the left. Both pictures have shadows but the Kitchen Maid is lighter and brighter overall. Woman with a Water Jug seems to take place in the later part of the day (darker shadows), and her clothing and surroundings seem much more elegant. Both have plaster walls and a table with a pitcher. The maid’s dress is a plain work dress, without trim or decoration. Compare the dress this woman is wearing to the dresses seen in Girl Reading at an Open Window and Soldier and the Laughing Girl. What do you notice about their dresses? All three women have on the same dress. Can you find any other similarities in these three paintings? A carved lion-head chair can be seen in each painting. All three have a leaded glass window on the left. Girl Reading at an Open Window and Soldier and the Laughing Girl have exactly the same leaded glass pattern to the window. Can you find any differences? Girl Reading at an Open Window wears no hat; in the other two paintings the women each wear a different type of white hat. (Grades 3-5) Set a pitcher low enough for the kids to see the FORESHORTENED CIRCLE of the opening at the top. Demonstrate how to create a foreshortened circle and have the kids draw along with you on a scratch piece of paper. Instruct them to create the shape of a pitcher beneath a foreshortened pitcher opening like the one that they drew along with you. Explain that foreshortening helps create an illusion of DEPTH in a two-dimensional picture. The pitcher should be large enough to fill up most of the page. 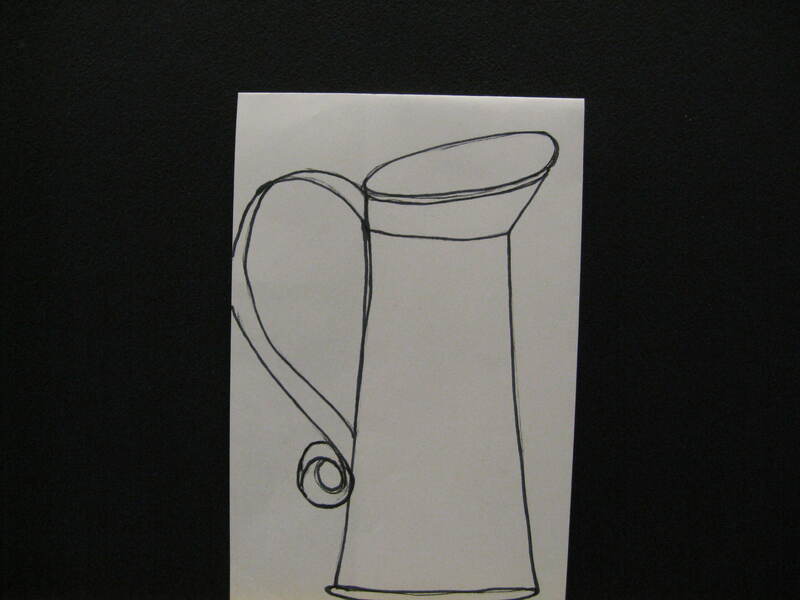 Paint or color the pitcher to match the drawing prop. (Grades 4-5) Bring in a pitcher and set it at the front of the room. Do the same foreshortened circle demonstration as above. Shine a light on one side of the pitcher, to cast a shadow. 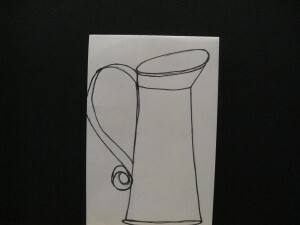 Draw and shade the shape of the pitcher with charcoal. (Grades 3-5) Use a pitcher as part of a Still Life arrangement to draw with a pencil. 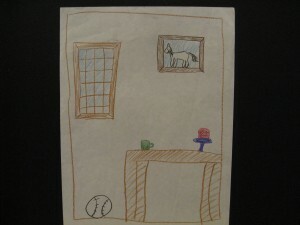 Bring in a lamp to place on one side of the arrangement for the kids to add shadows to their drawing when it is finished. Center the pitcher and place a round object (sphere) and a squared object (cube) on either side. Arranging the still life objects this way (in a triangle, with the pitcher forming the highest point of the triangle) helps to make the arrangement more interesting and exciting. The organized arrangement of a triangle is more attractive to the eye. Using the sphere (a ball, an orange, etc.) and the cube (small decorative box) gives the kids a chance to learn how to create the illusion of form (sphere, cylinder, cube, cone, pyramid) when drawing flat, geometric SHAPES (circle, square, rectangle, triangle) and to shade them. It also teaches or reviews the 3-5 grade EALRs of SHAPE/FORM. 4. 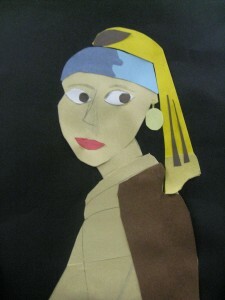 “Girl with the Pearl Earring” 18 ¼” x 15 ¾” (Circa 1665-1667). 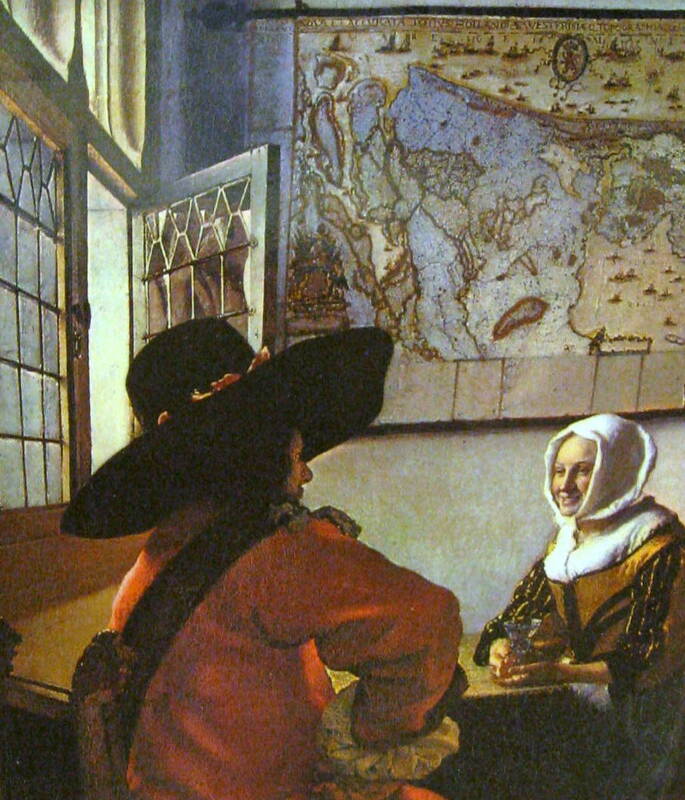 Vermeer was obsessed with surface appearances and with optics. Many of his works were made with the assistance of a filmless forerunner of the modern camera, called the CAMERA OBSCURA. Using a series of lenses, the camera obscura lets the viewer isolate and focus on a single subject with breathtaking clarity. A camera obscura was probably used for this Portrait of a young girl. Clues of this are the soft, blurry edges of the portrait and the magnification of the close up view. Her features have been very carefully, but selectively, recorded. Some art critics believe Vermeer’s interest in painting smooth surfaces prompted him to leave off the girl’s eyelashes and eyebrows. Portrait artists of Vermeer’s day would not normally have done this and it was not the fashion of the time. Other critics believe the delicate lines of the eyelashes and eyebrows may have been destroyed by poor cleaning methods for the painting at some time over the years. The girl has on a large pearl eardrop, or earring. Eleven of the women in Vermeer paintings wear pearl jewelry. He enjoyed painting the effect of concentrated light reflecting on these jewels, and 17th century Holland, pearls were probably an extremely important status symbol. This is the most beautiful pearl in all of his paintings. The dark background of the picture enhances the three-dimensional appearance of this young woman, who also closely resembles the woman seen in the painting The Artist in his Studio/The Art of Painting. Many scholars believe that the model for this painting may have been Vermeer’s first daughter, Maria, who would have been about 12 or 13 years old in 1665-1667. None of the figures painted in any of Vermeer’s paintings have ever been positively identified. The only reasons for this theory are that Vermeer had a daughter who may have been old enough to have been the model at the time this picture is believed to have been painted, and the same young woman probably posed for the second picture (The Artist in his Studio/The Art of Painting). In this painting, Vermeer was infinitely painstaking, and it seems to have taken him quite a long time to finish this painting. He normally spent months on every picture he painted. This may have been the reason Vermeer died in bankruptcy—he may never have produced enough paintings to make a very good living at it! From which direction is the light shining in this painting? There is no light reflected in the background. If a light were shining on the girl, some light would be reflected behind her. This painting is highly unusual, and very different from all the others, because it is as if the light is actually coming from the face of this girl. The dramatic contrast of the solid colored background focuses more attention on the portrait. The dark background is another indication of the use of a camera obscura. In Vermeer’s time, this portrait must have been truly amazing! The portrait is so realistic, painted 200 years before the first photograph was ever taken, people in Vermeer’s time probably felt it appeared as a mirror image of reality, like a modern photograph. It may have seemed eerie in those days. Do you think she is someone you might like? Do you think the artist painted her well enough to give us any idea of her personality? Trace an outline of the girl’s portrait, using pink tissue paper. Cut out the (positive) portrait shape and save the outside (negative) shape. 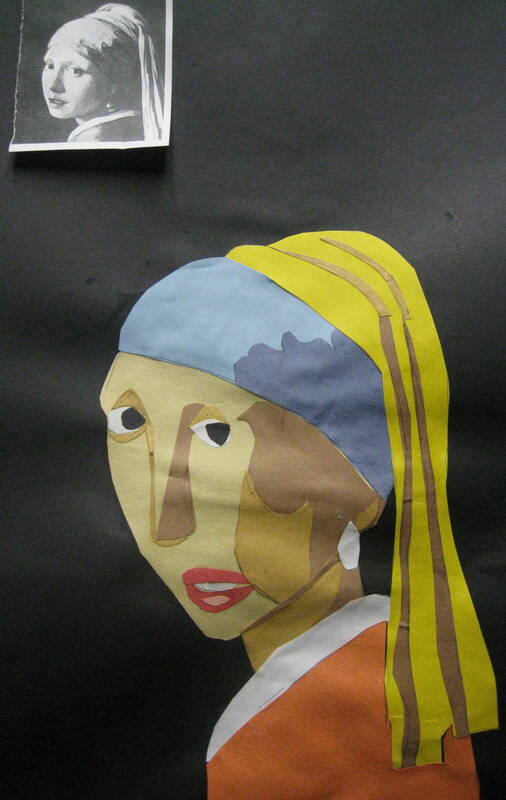 Lay the colored paper around the portrait, to change the background color. Cut out several different background colors. Hold the differently colored backgrounds against the portrait and compare the effect each color has on the portrait. Do different colors change the MOOD of the portrait? What type of feeling does each color create for the viewer? Create self-portraits using oil pastels on black construction paper. 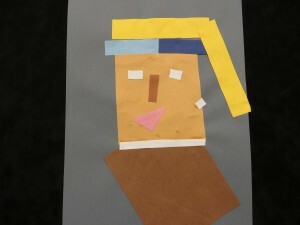 (All Grades) Create cut paper self-portraits on black construction paper. Cut all details from colored paper—NO DRAWING! Cut a symmetric oval from flesh colored paper by folding paper in half vertically. Fold a scrap of the cut paper to cut a symmetric neck. Attach the bottom of the neck to the bottom of black paper and glue oval above this. Cut hair, eyebrows, eyes, lashes, and mouth from colored paper. Use a different shade of a flesh scrap for lips and dark brown paper for black hair (so it contrasts the black background). Cut small (1” x 2”) pieces of white, blue and brown paper. (Kids tend to cut small details from the center of a large piece of paper, rather than from the corner or outer edge. If volunteer cuts small pieces ahead, it creates less waste.) Fold one small piece in half to cut two exactly symmetrical eyes at once. An excellent symmetry lesson for the youngest classes, who tend to create much less detail in their portraits. In K-3 classes, demonstrate steps systematically, as kids follow along. 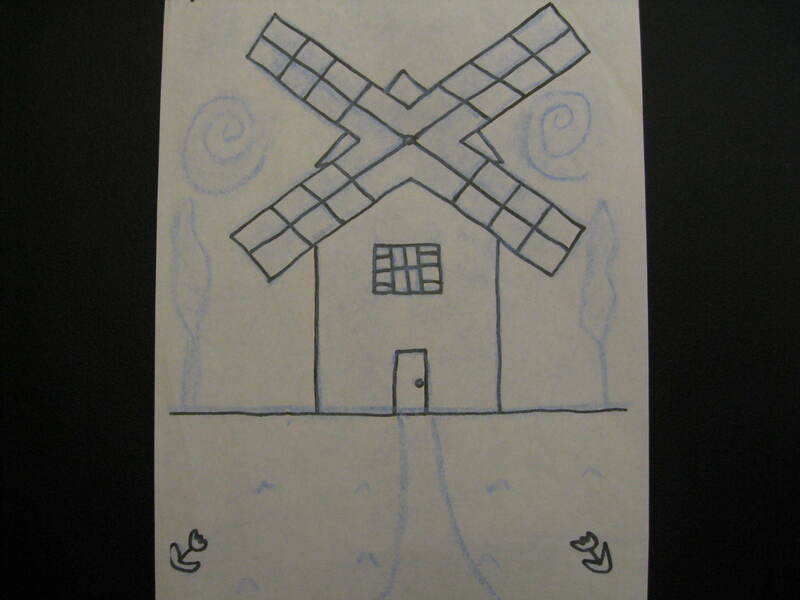 Allow kids to draw their own oval on their folded paper. You and the teacher can check if oval is drawn correctly— against the fold and large enough—before letting kids cut. Younger kids tend to draw the oval too small. Face should be large enough to fill most of the background paper (leaving space for hair). 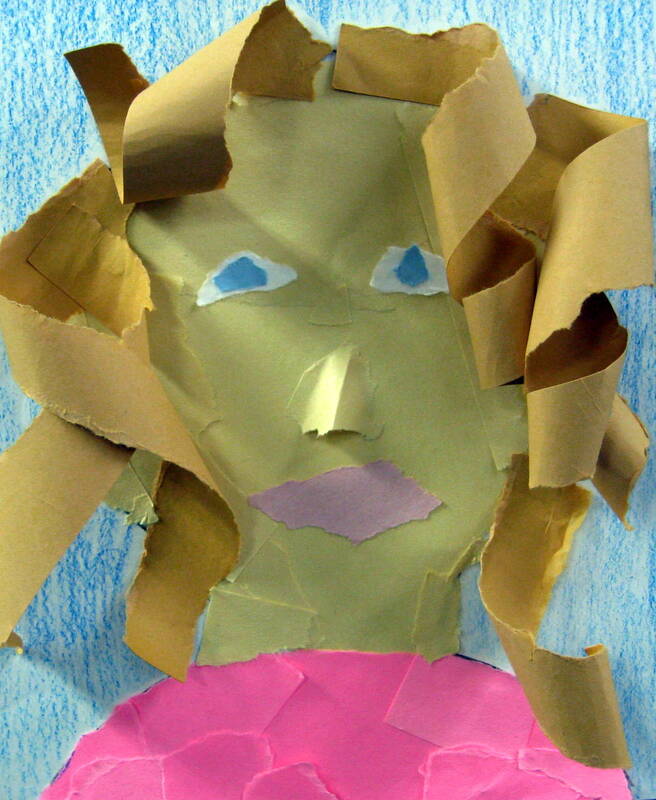 (3-5) Cut fairly large pictures of faces from magazines, or take a digital photograph of the classroom teacher (close up of the face and shoulders, against a plain background) ahead of time. Avon and fashion magazines can supply a better selection of good size faces. 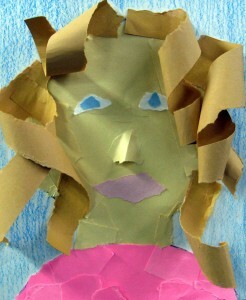 Cut the face in half and glue each half to a plain piece of white paper. Pass out these “half portraits” and let kids draw the other half of the portrait with pencil. 5. “Girl Reading at an Open Window” 32 ¾” x 25 ¾” (c. 1657). Women absorbed in letters—reading or writing them, receiving or sending them—reappear in any of Vermeer’s paintings. The window at the left of the picture is another common detail of Vermeer’s paintings. Vermeer loved to work with the effects of light and shadow in his interior paintings. He was very good at this. No other artist has been able to create the same natural effect with the same exact quality of skill. The placement of the girl—against a high, lightly colored plaster wall and behind a table with food or drink—is also typical details of Vermeer paintings. Experts believe that this may be Vermeer’s young wife. She appears often as a model in his paintings, frequently wearing this same black and gold dress. Apparently, the dress was a studio prop you can see in other Vermeer paintings. 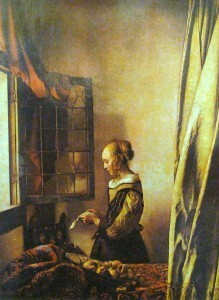 In this painting, the young woman is standing in the light flooding through the open window. As she intently studies the letter in her hand, we notice that her face is reflected in the windowpane. Can you see her reflection? (Have someone from the class point out her reflection in the corner of the opened windowpane.) We see that she is alone in the room because the windowpane reflects only her own image. The artist emphasizes the sense of our entering a private world and moment by placing an illusionistic curtain on a rail, in front of the scene. X-rays have revealed that the curtain was not part of the original painting design, and was added later. The curtain sets a lonely MOOD—this girl is, at least for the moment, completely alone and cut off from the rest of the world. The curtain also creates DEPTH in the picture, making the girl seem farther away from us. X-rays also reveal that a framed portrait of Cupid was originally painted on the wall behind the girl but the artist painted over it and left the wall plain. What do you think a framed painting of Cupid might represent? Cupid might represent a love letter. Why might the artist have decided to paint over the painting? Maybe the artist did not want to tell the viewer that the letter was a love letter. The viewer now has to use imagination and guess about the letter. Compare this painting with Woman in Blue Reading a Letter. What is similar? What is different? Does this woman look familiar? She is the same person. Vermeer’s wife, Catharina Bolnes, the daughter of a brick maker, probably modeled for her husband’s paintings. She was also the mother of his 15 children (only 11 survived infancy). Models cost money to hire and although he was a very talented artist, for Vermeer, money was always in short supply. It would have saved the family money if Vermeer’s wife had posed for him—but we will never know for sure if this was Catharina. Vertical LINE? Horizontal LINE? Curved LINE? 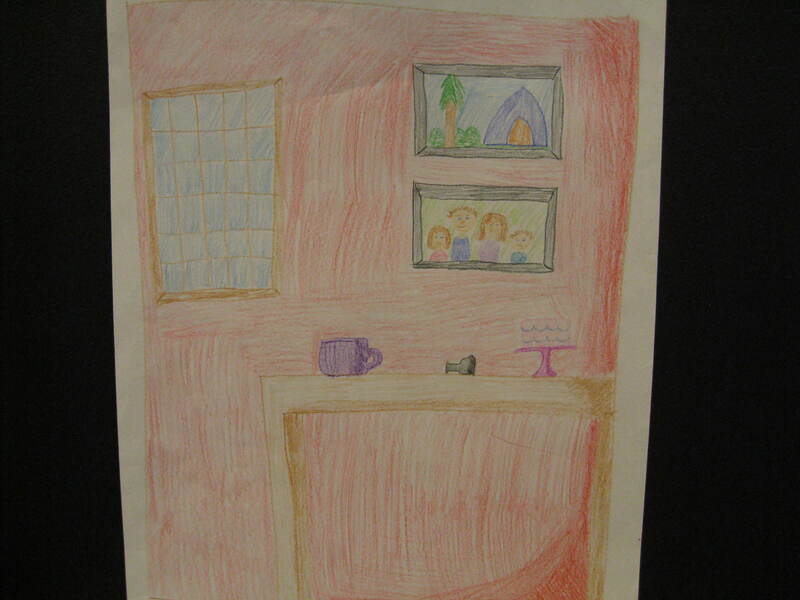 (All grades) Create a modern indoor (genre) scene of a person writing or reading a letter. In the picture, include some of the same typical features found in a Vermeer picture—light colored wall with a high ceiling, hanging pictures or a map, a window shining light into the room, shadows on the wall or furniture, a musical instrument, lion-headed chair(s), a cloth covered table, Turkish rug, a black and white tiled floor pattern. 6. “Woman in Blue Reading a Letter” 18” x 15” (c. 1664). Vermeer did something a little different in this painting—he did not paint a window. Although no window is seen, the light in the room seems to be coming from a window to the left. In no other painting has the artist been more successful in conveying such a realistic sense of the light sliding across the wall as well as across the map on the wall. Notice the chair in the right FOREGROUND. The chair fills in the lower part of the picture and connects with the woman’s skirt. How would the picture look if the artist had not painted in this second chair? The corner would be empty. The chair on the right fills in the empty space and helps direct our eyes to focus on the woman in the center of the picture (FOCAL POINT). This empty chair might also suggest an absence of someone important to the woman, the letter she is reading does too. Compare the colors used in this painting, the ones Vincent admired, to the colors of other paintings in this packet. Do any others have the same blue, citron yellow, pearl gray, black, and white? Can you think of any ways that letter writing or communication has changed since Vermeer’s days? In the 17th century, people frequently wrote letters and had them delivered by hand. We can now send mail through the post office or e-mails through the computer. E-mails can be read on the computer screen and are often not even printed. In Vermeer’s day, there weren’t any computers, or even telephones, so the only way people could keep in touch with friends or family, even as close as in the next town, was to write letters on paper. Today it is quick and easy to call and talk to someone far away, so people don’t write (or even e-mail) each other as often as they used to. Cars and airplanes also make it easier to communicate with someone in another town and even across the world. 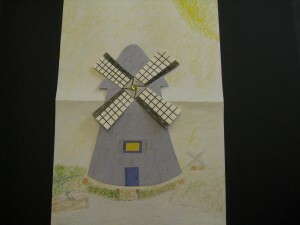 (Grades 2-5) Create an indoor scene of a person reading an e-mail letter. 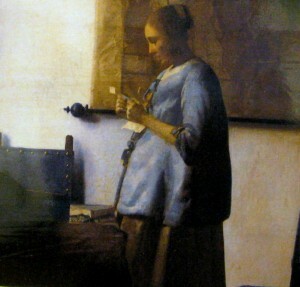 Although this picture is based on a modern invention, the computer, include some of the typical characteristics found in a 17th century Vermeer scene—light colored wall with a high ceiling, hanging pictures or a map, a window shining light into the room, shadows on the wall or furniture, lion-headed chair(s), a cloth covered table, a black and white tiled floor pattern, or a curtain in the foreground. (All grades) Create a diorama of your own room (an interior) inside a shoebox. Use cardboard, poster board, construction paper, fabric scraps, felt, markers, or crayons. Make very simple three-dimensional furniture. Include the carpet, your bed, the decorations on your wall, the light switch, closet door, window, etc. The diorama could also be the perfect dream bedroom you wish for. (Grades 4-5) Use graph paper to draw the floor plan of your bedroom. 7. “The Love Letter” 17 ½” x 15” (c. 1665-1670). Holding a letter in her hand, which has been handed to her by a smiling maidservant, this seated lady is seen through an open door. The handle of a cittern (a stringed musical instrument) is in her other hand. It was popular among the upper classes in 17th century Holland to add musical instruments in paintings, which was seen as a sign of sophistication. Vermeer painted musical instruments in many of his paintings. The artist seems to have stopped the action in this scene. The expressions on the faces of the two women seem to give a hint of a story. What type of MOOD can you see? We are caught in suspense, waiting to know what is going to happen. How does the woman feel about getting this letter? Who wrote it? What does it say? Could Vermeer have given us a hint that the letter writer is far away by putting a landscape and a seascape on the wall? Trace an invisible line between the eyes of the woman and her maid and then from the maid’s eyes to the letter. Can you see this hidden triangle? What features can you see in the FOREGROUND? (Bottom area of picture, closest to the viewer) A pair of wooden shoes and a long-handled brush and there is also an open doorway and objects to the right of the doorway, as well as a curtain pulled back from above the doorway. The foreground area is mostly of another room, which is darker than the room the two women are in. What makes this painting different from the other interior scenes of this artist? We have to look through a doorway to see this scene. We are outside of the room the two women are in. The other Vermeer scenes give the impression that the viewer is in the room with the subjects (people). 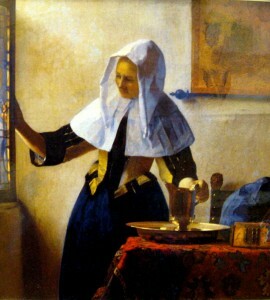 Vermeer is famous for his use of light. Where is the light in the room coming from? There are clues in the shadows that tell us there must be a window on the left. The maid’s blouse is bathed in light on the left, the other side is shaded. The seated lady’s dress is bright on the left, slightly shadowed on the right. The picture frames on the wall cast a shadow to the right. Can you see the woman’s glowing pearls? Vermeer layered dabs of white paint that, from a distance, seem to be made of light. This artist loved to paint the effect light had on pearls. How does the artist use light to show distance? The room in front is darker, the room in the distance (through the doorway) is much brighter and seems farther away. The artist placed the subjects (women) higher in the painting (MIDDLEGROUND) to help them seem farther away. The light makes the room (that the women are in) stand out and helps focus our attention on the two women. An interesting detail about Dutch genre paintings is that even in the most elegant and rich homes, wooden planks covered most of the floor area. During the cold Dutch winters, floors were also covered with simple reed mats to protect them from mud and keep feet warmer. Tiled floors were found only in very small areas of the wealthiest homes. The reason so many Dutch interiors were painted with tiled floors was probably that artists loved the illusion of DEPTH or distance these tiled floor PATTERNS helped create, not that so many were actually tiled in this way. The contrast between light and dark helps define space as Vermeer leads our eyes through the doorway and past the draped curtain to a picture within a picture, or the second room framed by the doorway. The Ermine and yellow dress this lady wears appears in several other Vermeer paintings—Young Woman Writing A Letter, Lady and Her Maidservant, The Pearl Necklace, The Guitar Player. This elegant dress, with the ermine fur trimmed jacket, was typical of Dutch fashion in the 1660’s and was practical protection against Holland’s cold, damp weather. (4-5) Create a picture of an everyday activity that you and your family and friends might do—eating, reading, watching TV, or playing a game—as seen through an open door. Include parts of two different rooms and a doorway. 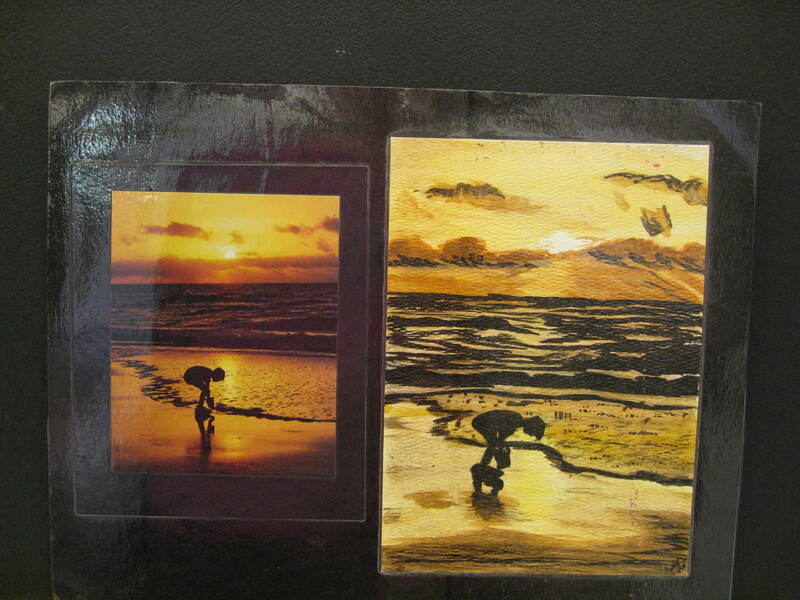 (4-5) Create a picture of a scene through an outside window. Drape a curtain on the edge(s) of the window, similar to the three Vermeer paintings that have curtains draped, to help create DEPTH or distance. Your window should fill a large part of the paper. Your scene should include objects that are closer and objects that are more distant. Who is this letter from? Was it mailed from a far away and exotic country or a nearby city or town? What is the occupation of the person who wrote it? Does the letter bring happy or surprising news? Is the woman surprised to receive it? Is she worried about opening it or excited to read what the letter contains? Since the title of the painting is The Love Letter, will it startle her? Could it be from a surprising new admirer? Does she already know the person the letter is from? Has she been waiting long to receive it? Is she irritated that the letter writer took so long to send it? Write your own imaginary letter to this woman in the painting. Make up a name for the woman, to begin the letter with (Dear ______), and sign the letter from the name of whoever wrote to her. Make the letter interesting, fun, exciting, amusing and creative! 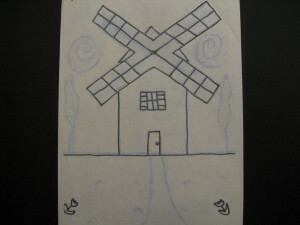 Draw a portrait of the person who sent the letter and attach the letter you wrote for displaying somewhere. See if your portrait and letter can be the most creative in your class! Write a story that answers the above types of questions and also tells what happened after this letter was opened. Create some type of unexpected surprise in your story. Draw a different picture to illustrate this second part of the story. 8. “The Soldier and the Laughing Girl” (Circa 1656-1660) 20” x 18”. What familiar and typical elements of Vermeer’s work do you see in this painting? Many familiar elements typical of Vermeer’s work can be seen in this painting. Have you seen this dress before? The woman appears in the same gold and black dress the artist used in Girl Reading at an Open Window and Woman with a Water Jug. Consider going to the library and checking out a book showing more of the works by Vermeer. The classroom teacher can assist in projecting pictures from the book on the screen for everyone to see. Look for other Vermeer paintings with more of the same details. Which details are similar/different? What do you see in the Foreground of this picture? The soldier, who is not facing us. The map behind the girl is a map of Holland, or the Netherlands. The map on the wall could also be a clue that the soldier is a man of adventure, who travels the world. Delft, where Vermeer lived, was a center for mapmakers. Mapmaking was a well-respected profession, something between a science and an art. Many areas of the world had been fairly recently discovered and explored. Merchants in Holland were becoming very prosperous with new trade merchandise from these exotic places. Holland also had good seaports to support the influx of trading merchandise so a wealthy middle-class developed. This created a very different type society from the previous European Medieval and Renaissance years, when only two classes had existed—rich or poor. The black sash around the young man’s shoulder tells us he is most likely an officer. The girl’s smile, her direct gaze, her open hand lying on the table are all clues to indicate that she feels comfortable with the gentleman that she is sitting with. It is obvious with the gaze of these two that they are paying close attention to each other. The young girl’s open sunlit hand contrasts the officer’s hand, which is curled back in deep shadow. In the girl’s other hand she holds a popular drinking glass, seen in many paintings of the time, which was usually used for drinking white wine. The glass is a sign of the young girl’s social refinement. These particular glasses were produced in large numbers in Holland and in Germany during the 16th and 17th centuries. They were fairly expensive, so we know that the girl, or at least her family, was rather well off. It is very interesting how many things Art Historians are able to tell us about a painting simply by studying the clues painted in the picture. We don’t know for sure who the people actually were but there are still many things that we do know for sure about the people because the many details of the picture give us clues. 9. “The Artist in His Studio.” Also referred to as “The Art of Painting” (c. 1666-1667). During World War II, the notorious German leader, Adolf Hitler, once owned this painting. Hitler bought the painting for a museum he planned to open after he won the war. However, the Germans lost World War II. This painting, along with thousands of other valuable art treasures, was discovered in a salt mine in Austria at the end of World War II, after Hitler had died. Long before Hitler or World War II, Vermeer (who was penniless when he died) willed this painting to his wealthy mother-in-law, to help pay back some of the money he owed her. After that, the painting was lost for almost 200 years. When The Artist in His Studio finally appeared again, it was credited to a different artist. Eventually, the painting’s identity was straightened out, and now, after changing hands many times, the painting hangs in a Museum in Vienna, Austria. This is one of Vermeer’s last paintings. It shows an artist (possibly Vermeer) painting a picture of a model who is holding a trumpet in one hand and a book in the other. The model represents either Fame or History. It is believed the model represents Clio, the Greek Muse of history. In Greek myth, the nine sister goddesses who encouraged and protected the Arts and Learning were called Muses. Clio is described as a girl with a crown of laurel leaves (symbolizing Fame) holding a trumpet and a gold-covered book (symbolizing History). Behind the model hangs a map of the Netherlands—Vermeer’s birthplace and a land that is famous for its arts. The more sophisticated Dutch of the 17th century hung maps on the walls of their homes to give the impression that they were educated about the world. . The acknowledged world seemed to have grown throughout the 16th century and people wanted to give the impression that they knew all about the exciting places that Dutch ships now traveled for trade. The artist is dressed in clothing that was out of style, even in the 1600’s. Vermeer has dressed him in an “historical” costume to help symbolize that History should be the artist’s inspiration. Elegant fabrics lay crumpled on the table, along with a large mask, which may symbolize the artist’s historical inspiration and training in the art of the Classical Age. (The Classical Age is considered the time of history when the ancient Empires of Greece and Rome existed. This historic era is considered a time of great artistic achievement.) It is also an indication that the artist is a master painter. Drawing or painting from plaster casts of ancient Greek or Roman sculpture was once a basic requirement of an artist’s training. If you look closely at the artist’s painting, you can also see a maul stick or painter’s stick on the canvas. This was a tool many artists used to steady their hand for detailed work. It kept the artist’s hand away from the wet paint as he added details, and protected the picture. Artists used oil paint at this time, which took several days to dry, so many areas of a painting might be wet during one sitting. (Grades 3-5) Instead of blocking off the room, the draperies force us to shift our attention more deeply into the room. Our eyes are stopped—just for a second—by the table and the artist’s back. Then, the artist continues this MOVEMENT even deeper into the room, to the model standing behind the table and the map on the wall behind everything. What do you see in the FOREGROUND? A chair holds back the curtain so we can watch the artist. Do you see the mask on the table? Consider projecting this section of the painting on the classroom screen. What familiar Vermeer details do you recognize in the picture? The nine Muses were daughters of Zeus and the Titaness Mnemosyne. Their mother’s memory was as long as her beautiful hair for she was the goddess of memory and knew all that had happened since the beginning of time. Mnemosyne gathered her nine daughters around her and told them wondrous tales. She told them about the creation of earth and the fall of the Titans, about the glorious Olympians and their rise to power, about Prometheus, who stole the heavenly fire, about the sun and the stars, and most of all about the greatness and wisdom of their father, Zeus. The nine Muses listened to her with wide, sparkling eyes and turned her stories into poems and songs so they would never be forgotten. Apollo, the god of music, trained them and taught them to sing harmoniously together. He led the choir of Muses through the halls of Olympus and over the slopes of Mount Parnassus, and their music rang so pure and fine that even the songbirds fell silent to listen. The muses sang not only of the gods and of the spirits sprung from Mother earth, but also of great kings and heroes, descended from mighty Zeus. Their songs were tales of heroes and brave men. Each of the Muses had her own special art. Calliope, the Muse of heroic poetry, was the first among them. She had a mortal son named Orpheus, and he sang almost as beautifully as the Muses themselves. When he was grown, he left his mother and eight loving aunts to live in his father’s kingdom of Thrace and bring the joy of music to earth. His voice rang so pure and true that the fiercest warriors put down their swords and savage beasts lay spellbound at his feet. Trees pulled up their roots and moved closer to listen, and even hard rocks rolled up to him.